Elliott McCrea Hill’s Corporate & Commercial lawyers are involved in some of the province’s most significant transactions affecting business for all of the small, medium and large business sectors. Our experienced corporate lawyers provide a complete range of business law services and we pride ourselves in focusing on our clients’ specific business needs. Our corporate lawyers have extensive expertise in business matters pertaining to the dairy, farming and forestry industries. Different considerations apply to the purchase and sale of a business depending on the circumstances of each individual transaction. At the outset, we will advise you as to the considerations that apply to your situation. At the right time, we will perform the normal corporate searches, including corporate records, security searches, lists of employees, benefit programs, leases, etc. The results of these searches may influence the manner in which the transaction is handled. It is important that your lawyer is consulted early in the process in order to avoid potential problems from the outset. Decisions as to whether the transaction should be by way of the sale of assets or shares will be critical to a successful outcome for you. Typically, the vendor will want to sell shares, while the purchaser will want to buy assets. It is crucial to consider the tax implications of your transaction. We often work closely with your financial advisors in order to achieve the most beneficial tax consequences. These are just some of the issues which typically arise during the course of the purchase and/or sale of a business. Depending on the nature of the business interests being transferred and the complexity of the issues involved, legal fees will vary. 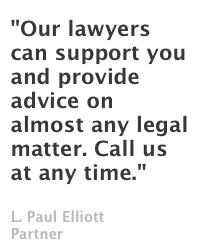 Elliott McCrea Hill’s lawyers have extensive experience in many aspects of construction law. We regularly advise developers, owners, contractors, subcontractors, and others active in this field. We advise our clients on all aspects of construction projects, including tendering, development planning, project management and construction contracts, and we work with them to resolve construction disputes and bonding claims. Elliott McCrea Hill also represents clients in criminal and quasi-criminal matters. These can range from serious Federal Criminal Code charges to various Provincial statute charges such as Motor Vehicle Act infractions. Our experience in the criminal law field has led us to strong and confident advocacy on behalf of our clients to all levels of the Courts of New Brunswick, from the lower Provincial Courts to the Court of Appeal. Elliott McCrea Hill also has extensive experience in defending Native Treaty and Aboriginal Rights against charges under the various natural resources legislation. If you have been charged with an offence and are in need of effective representation, or if you just have a question about your case, Elliott McCrea Hill’s Criminal Lawyers are able to assist you. Elliott McCrea Hill provides a wide variety of experience in dealing with Family Law matters. While it is impossible to touch on each issue that may fall under the rubric of family law in a few short paragraphs, the Solicitors of Elliott McCrea Hill are prepared to provide simple, accurate, and effective advice in a straight-forward fashion regarding all family law concerns. Generally, family law areas of concern can be said to fall under the broad categories of Adoption, Cohabitation, Marriage, Separation & Divorce. 1. ADOPTION Formal Adoption of children was essentially unknown to the common law until it was adopted by statute in most of Canada in the early 20th Century. The law has undergone many revisions since the introduction of the initial statute however the process often poses difficult to answer questions. The main types of adoption that commonly occur today are Step-parent adoptions and, to a lesser extent, International adoptions. Assistance and advice regarding the adoption application process and prerequisite requirements are often fielded by the Solicitors at Elliott McCrea Hill. 2. COHABITATION Cohabitation and “common law” relationships have become commonplace in today’s society. Yet, with so many cohabitating couples the number of persons who fail to realize the legal significance of their relationship, and/or the lack thereof, is dramatic. Early identification of a “common law” relationship and the determination of rights and responsibilities thereof through guided discussions and/or cohabitation agreements are services provided at Elliott McCrea Hill. 3. MARRIAGE Marriage is a form of legal contract entered into between two persons. To most marriage is seen as the natural extension and expression love and commitment. Although the emotional and social aspects are easily recognizable by the prospective couple, the legal implications of their union is all too often overlooked. Legal marital advice and/or marriage contracts may serve to alleviate confusion and assist in defining pre-existing issues such as responsibility for certain property and debts among others. 4. SEPARATION & DIVORCE Divorces, however unfortunate, are a fact of life for some which must be dealt with. The emotional intensity surrounding the dissolution of a marriage is often tremendous and in some instances the parties to a divorce may fail to realize the significance of certain actions or inactions as the case may be. Timely and effective advice regarding marital property issues, spousal and child support issues (including variances), and custody and access issues are just a few examples of the expertise which the Solicitors of Elliott McCrea Hill provide. The legal team at Elliott McCrea Hill is able to provide the prospective family law client with up-front and straight-forward answers to questions and advice regarding all manner of family law issues and concerns. The issues of child custody, access and support are considered corollary issues which would be dealt with in accordance with the Divorce Act on the termination of a marital relationship or in accordance with the Family Services Act upon the termination of a common law relationship. In 1997 the Federal Child Support Guidelines were introduced throughout Canada, these guidelines provided a prescribed method for the calculation of child support under the Divorce Act. Shortly thereafter every province in Canada, including New Brunswick, adopted the Child Support Guidelines for calculating child support in non-marital child support situations. Since 1997, our nation’s courts have had many opportunities to interpret the Guidelines and have ruled on issues such as shared custody and retroactive entitlement to child support. Although the guidelines have provided a regulated framework for child support calculations, it is important to consult a lawyer if you have any questions in regards to custody, access or child support. Municipal law, while utilizing a knowledge of the legislation governing municipalities, is more significantly the application of a consultative approach to the municipality and the affected neighborhood. In representing a private sector developer or individual coming to a municipality with a specific objective in mind we focus immediately on the goals of the municipality as they touch on this endeavor as well as those of the neighborhood. We understand that progressive municipalities accommodate development proposals of any size when they are in step with the stated objectives of the municipality and have received input from the neighborhood. We know how to access municipal planning goals, secondary plans, available studies, etc. Just as significant is a personal relationship with municipal staff who have an enormous impact on a proposal’s success and often are more than willing to share their trade craft to get a better proposal. Getting the developer, the municipality and the neighborhood on the same page is an exercise in communication, respect for all parties and a knowledge of the goals of everyone. As facilitators of this process, we help our clients minimize time consuming negative planning process set backs and expedite proposals through the municipal planning process with the goal of a positive outcome for all parties. The purchase and sale of residential and commercial property comprises another aspect of the services provided by Elliott McCrea Hill. If you are purchasing your property, we will be responsible for verifying title to the lands and premises. In 2001 the Province of New Brunswick introduced the Land Titles System throughout New Brunswick. Over time, all property in New Brunswick will be converted to the Land Titles system. A conversion is required where land is mortgaged or sold, subject to certain exceptions. Once a parcel of land has been converted to this system, title to the property is guaranteed by the Province of New Brunswick. Conversion to Land Titles is done through an exhaustive examination of the title deeds and other documents which are registered at the Registry Office. The information required by the Province is then submitted with a Certificate of Title. The province then issues a Certificate of Registered Ownership, which sets out ownership of the parcel, and any charges against it. As part of this process, we will ensure that the Vendor is the proper owner of the property, and that the property is not subject to any charges, liens, mortgages or easements. We will arrange to have any discrepancies in the title corrected prior to the close of the transaction. If there are any existing mortgages other than your own, we will either have them discharged or we will close on the Vendor’s undertaking to provide us with the discharge at a later date. If we are unable to remove or correct any problems which may exist in the title, we will advise you as to what steps may be taken. We will also verify real property taxes, water and sewage taxes and other municipal assessments and levies. When the transfer of the property occurs, we will have calculated and prepared a “Statement of Adjustments” between yourselves and the vendor with respect to the deposits and charges outstanding which were incurred while the vendor occupied the property, including real property taxes, water and sewage. We will examine the Deed from the Vendor to yourselves and we will prepare the necessary affidavit to have your Deed recorded in the Registry Office. 1. Certification of the positioning of the house and any improvements on the land which you are buying. This service can only be provided by a qualified land surveyor. 4. Verification of the quality of construction of the building, or its contents. We recommend that a professional inspection of the property be conducted. 6. Connecting utility services. For further information concerning fees and disbursements, please feel free to contact our office. The two most common tools of estate planning are the Last Will and Testament and Power of Attorney. Many people will not require much beyond these two documents to ensure that their wishes are met. In other cases, the nature of the estate is such that it may be desirable to develop a more complex estate plan which provides beneficial tax consequences. In these cases, we work closely with your financial advisor in order to give effect to these arrangements. Regardless of your financial situation, the Will is the foundation of any estate plan. There have been changes to the Infirm Persons Act in recent times, which now make it possible to execute an Attorney for Personal Care. This is similar in principle to a general Power of Attorney, except that rather than dealing with financial matters, your Attorney is given the capacity to make decisions as to your medical care. Without an Attorney for Personal Care, decisions concerning your medical treatment will be left to your family. Clearly, in cases where difficult decisions must be made, there may be conflict among family members as to the appropriate course of action, with resulting confusion and delay in the decision-making process. The Attorney for Personal Care resolves this issue. A will is an essential part of an estate plan. But it is only one part of that plan. Other key instruments may be domestic contracts, insurance policies, RRSPs and other investments. These documents should accord with one another. One should not overlap, repeal or be inconsistent with the other. Therefore, a comprehensive estate plan will require advice from financial planners, accountancy and taxation experts, lawyers, insurers, and other professionals. Elliott McCrea Hill acts for both employers and employees in resolving non-unionized employment matters. Navigating through the rights and obligations arising under Employment Standards, Human Rights and Public Service Labour Relations Legislation combined with the applicable common law principles can be difficult for either side to an employment dispute. Our Elliott McCrea Hill lawyers guide our clients through the process with a view to avoiding employer/employee conflict when possible and resolving the matter efficiently when not possible. Debt collection, Creditor protection and handling bankruptcy related matters can significantly affect a company’s very survival in the business world. Elliott McCrea Hill’s lawyers have assisted their clients with everything from collecting accounts to representing their interests in CCRA Creditor Protection applications and advising with respect to the Bankruptcy and/or Insolvency process. A wide range of solutions are available – our lawyers take pride in finding the solution that works best for their clients.